Due to the enormous amount of machinima videos in our group, I need to get moderators. 1- select the videos they find interesting and make a proposal to the group admin (me, Jordi). Think of it as nominations for the award. 2- eliminate those videos they found that are spam, ads without artistic interest, or tests. It's simple, just delete them as you find them while searching for good works. 3- Maybe moderate the admission of new works. This is only a possibility. If we finally do this, we may add a limit on the weekly submissions, to not overload the moderator's work. This is a position for people who enjoy watching machinima videos, enjoy the work of these creators and would like to have influence on who receives the featuring. Any member may apply for it, no matter if they received awards or not. Would you like to post a reply? 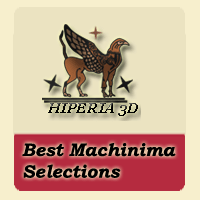 you'll need to join Hiperia3D's Machinima Selections. Loris Rizo wins the award! Featured machinima "Stay with me tonight"